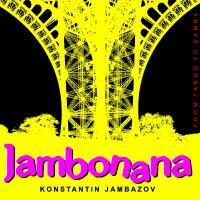 "Jambonana" is an album by Konstantin Jambazov recorded in 2010. It combines the styles of Gypsy jazz (Django Reinhardt), French and Argentinean music (Astor Piazzolla, Richard Galliano) and also have influences by Al Di Meola, John McLaughlin. The tracks vary from flamenco, tango, bossa nova, samba, swing, polka and waltz. The tracks are composed by Konstantin and he plays guitar, piano and keyboards.